Fox Sports West, which broadcasts Clippers games, has a promotion deal with Subway. 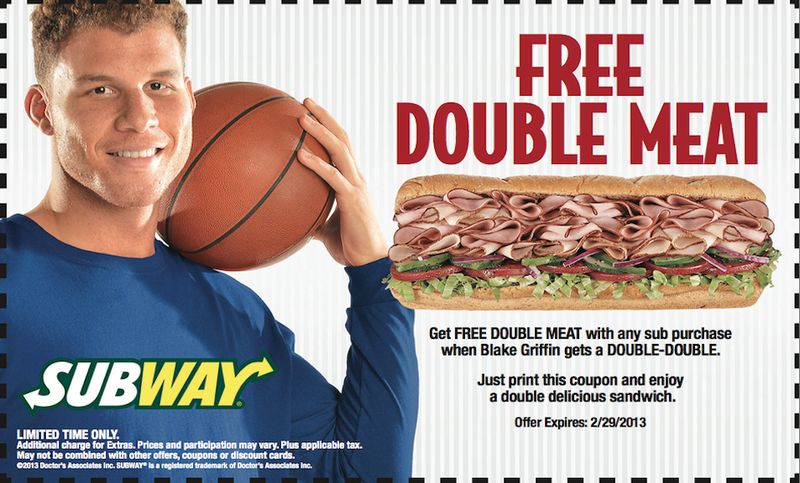 Any time Blake Griffin goes for a double-double, you can print out a coupon to get double the meat on your sandwiches the next day. Griffin sprung for 18 and 14 against Indiana last night, so it's Subway time. As thanks for reading Deadspin we wanted to give you this coupon that expires Feb. 29, 2013, which is a day that will never be. We believe that if you were to use this coupon, it would end like "The Nine Billion Names Of God."